Allows you to control calls and organize voice mail and contacts.  VIP 7 from Action CTI applications work with your ESI system to enhance your day-to-day communication, including the ability to control calls and organize voice mail and contacts and is compatible with all ESI Communications Servers (ESI-1000, ESI-600, ESI-200, ESI-100, ESI-50, ESI-50L). VIP 7 from Action CTI is easy to implement. It connects to your existing local area network (LAN) and is non-invasive. There’s no need to upgrade the LAN or install Microsoft® Exchange® — thus avoiding a costly and impractical solution for the small to mid-size business. Main window — Provides provides ESI desktop phone functions on-screen. And the Quick Contact™ list makes it easy to dial those whom you call most often (see “Contact management”). Color-coded icons show you stations’ status, the same way your ESI desktop phone’s tri-color feature keys do. Icons give you quick access to editing contact information and either e-mailing your contacts or — if there are other users in-house of VIP 7 applications — sending instant messages to them. A “sliding” volume control bar lets you set the loudness of your handset or speakerphone, depending on which you’re using at the time. Customizable ribbons — These put each of your most frequently used functions just a click away. Simplifies setup of conference calls — Build the list of participants on-screen in advance, saving time for all; then just click to start the conference call. On-screen Caller ID4 display makes it clear who’s connected and when. Esi-Keys — The Esi-Keys feature lets you set up single-click access to stations, mailboxes, departments, and speed-dial numbers. This field of up to 144 on-screen buttons displays each station icon in the same color-coding as a similarly programmed key would have on an ESI phone, allowing easy, at-a-glance recognition of the station’s status. (Off-premises indication and Personal Call Routing require optional ESI Presence Management. Manages voice mail — View voice messages, live call recordings, and personal memos; prioritize each message by importance; and select voice mail messages for playback. Synchronizes automatically with ESI phone system’s voice mail — Regardless of whether you use the phone keys or the VIP 7 interface to handle a voice message, the VIP 7 voice mail display provides a continually updated indication of new, old, and deleted messages. 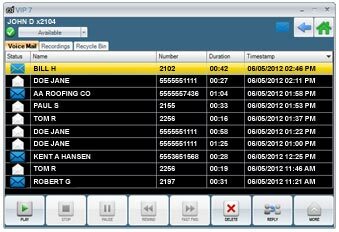 Shows Caller ID data for each message — Just as ESI phones typically show Caller ID information, VIP 7 displays that information on the PC screen. Recycle Bin — Keeps 105 of your most recently deleted voice messages — any of which you can restore quickly if you deleted it by accident. Plays back through phone — Some competing products cause all messages to be played back through the PC audio system. However, VIP 7 uses the audio capabilities in the ESI phone, so the user can still pick up the handset to hear messages privately. This also keeps you from having to use a headset with the PC. Saves voice messages as .WAV files, but only when desired — Unlike less intelligent solutions, VIP 7 gives you a choice of whether to save a message as a .WAV file. This spares your network the burden of moving a potentially large .WAV file every time someone in your office gets a message. Instant messaging — As an alternative communications method for VIP 7 users, instant messaging allows quick, unobtrusive exchanges between employees and ends the need for intrusive background announcements and “whisper-paging.” There are even built-in, one-click Quick Responses to simplify and speed up communication between users. Moreover, this messaging is safe because it functions on only your ESI system, protecting your organization from the viruses, “spIM,” and other hazards of Internet-based instant messaging. Call Log — Tracks all calls coming into and from your station. Missed calls — You can sort the Call Log for easier viewing of missed calls. Imports contacts from Outlook, and GMail. Synchronizes with ESI phone system’s speed-dial lists (“Dexes”) — The phone system’s Esi-Dex lists are a valuable source of contact information. Whenever a contact is added to or deleted from the ESI system list, VIP 7 automatically synchronizes with the change. Quick Contact list — This integral part of the VIP 7 screen provides easy access to frequent contacts. 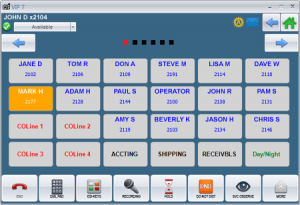 Familiar Windows interface — Simplifies programming of ESI desktop phone station features. Manage external message notification, personal greetings, programmable feature keys, and more. Other VIP 7 applications with additional capabilities also available. Contact Action CTI for information. IP Server 900 or ESI Communications Server (ESI-1000, ESI-600, ESI-200, ESI-100, ESI-50, or ESI-50L).